Earlier we reported the deferral of the emergency bridge loan for Glebe Park. But this past Saturday, Alexandria City Council re-considered the loan and approved it, allowing the project to go forward. Here's the story as reported AlexandriaNews.org and The Alexandria Times. 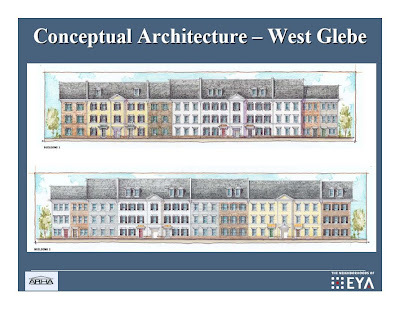 The $15.7 million Glebe Park redevelopment is slated to replace 40 public-housing units in the existing Glebe Park property in Arlandria and 44 units from the James Bland property in the Parker Gray neighborhood. Because proceeds from the sale of the market-rate lots at Bland are needed to finance the redevelopment at Glebe, the credit crunch has created a backlog in both neighborhoods. And city officials said that without the loan, both redevelopment efforts would be stalled indefinitely.